The Moy system produced over 200 salmon for the week bringing the yearly total, so far, to 571. It was the best week of the year so far and good catches were reported throughout the system with the Moy Fishery beats and the middle reaches fishing best. On the Ridge Pool, Michael Dix, Cork, had 3 salmon on fly (2 released), best at 13.75 lbs. 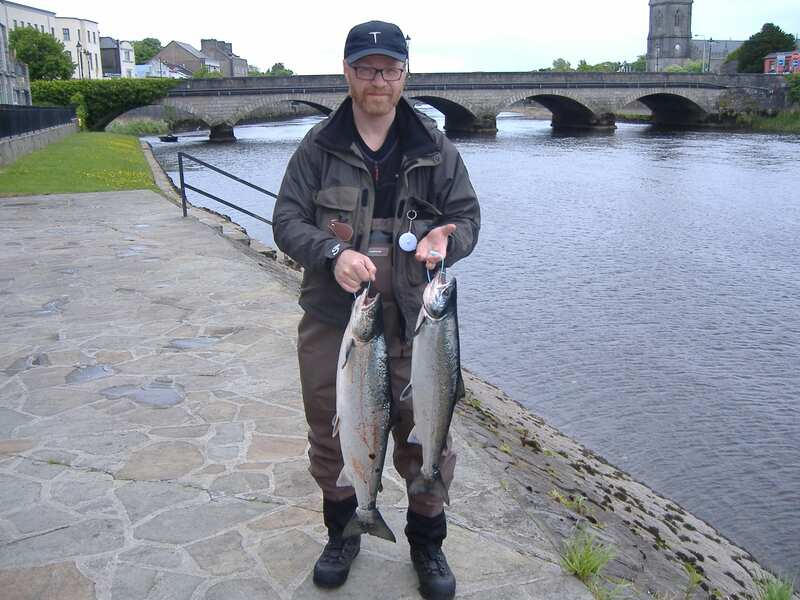 The Weir Pool produced 2 salmon for fly angler John McKinley, Athlone, while Gerhard Linder, Norway, landed a nice brace (8 lbs. & 9.5 lbs.) on the Cathedral Beat also on fly. 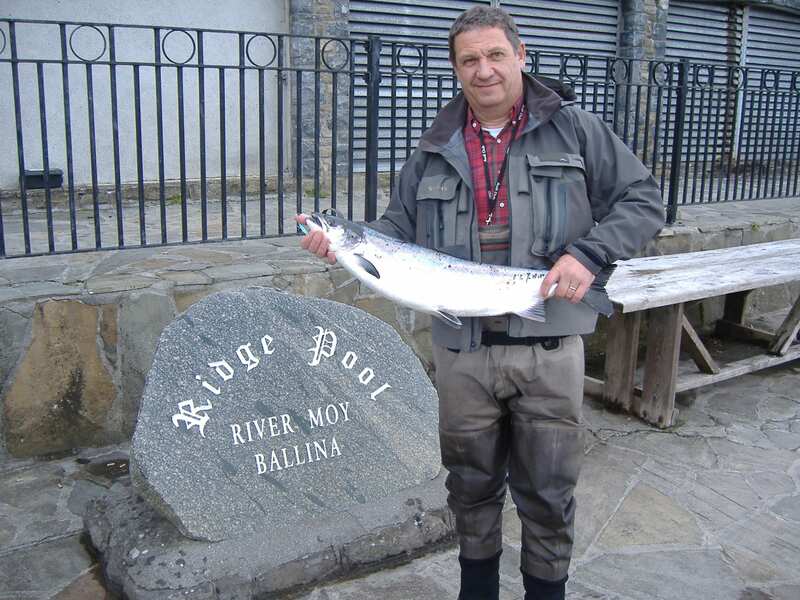 Michael Dix, Cork, with his best Ridge Pool salmon weighing 13.75 lbs. On Mt. Falcon, Jim Wilson had a ten pounder on fly, while Willie Sheppard caught the first three fish of the season on Coolcronan. Swiss visitor, Jurg Gasser, did well on Gannon’s where he landed an 8 lbs. fish on prawn. The Foxford Fishery also did well during the week with Quentin Condo, Canada, catching a 6 lbs. salmon on fly. Further up river on Cloongee, a group of 4 French anglers guided by Tierry Coulm enjoyed good sport landing a total of 10 salmon on spinner and bubble & fly. Garrett McMorrow, Northern Ireland, had a fine 11 lbs. salmon on worm fishing East Mayo. Judd Ruane reported that the excellent sea trout fishing on the Moy Estuary continued for another week. There are still plenty good fish in the bay and fishing sand eel and mackerel strip seemed to be the most productive method. Dave Cox, Frank Neary and Joe Byrne caught 9 fish (6 returned) on Saturday, best at 1.7 lbs. Trout fishing on Lough Arrow received a damper with blustery showers and strong winds impacting at times. However, some mayflies were hatching in sheltered areas allowing for some good spent fishing. Phill Siddal, UK, had 3 trout (all returned) to 1.5 lbs. on a Grey Wulff, while Gerry Martin caught 4 fish to 3 lbs. on dry mayflies. Ken Murray and Gerry Kelly had 6 trout over the weekend on wets. Lady angler, Sarah Maxwell, boated 2 trout at 3 lbs. 12 oz. & 2 lbs. 10 oz. on the dap. Sligo Anglers Association held their annual May Festival Cup Boat Competition on Lough Gill over the weekend. A total of 18 anglers (9 boats) took part in the event. Results were as follows: 1st R. Fabozzi & J. Henry 2 lbs.10oz. ; 2nd B. Conneely & T. McLoughlin 1lbs.11oz. ; 3rd F. Stenton & G. Lindsay 1lbs.10 oz.